How do Distributed Antenna Systems Work? If your lucky enough to attend a football game at Notre Dame's Stadium, there’s a good chance you may have noticed something aside from Touchdown Jesus, the action on the field and the Fighting Irish Marching Band. Yes, you may have noticed how good the cell service was. Cell service at major sporting events has the potential to be very hit or miss, as tens of thousands of people are potentially accessing the network at the same time. 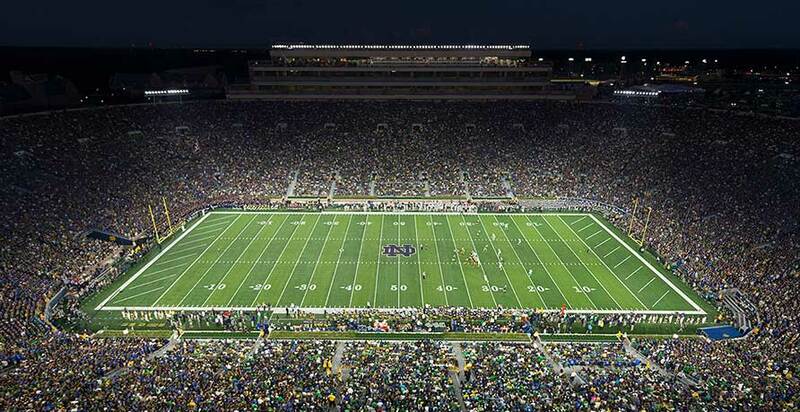 Because of this, many sports venues, such as Notre Dame Stadium, are strategically placing various antennas throughout their facilities to ensure strong, reliable cell service. This network of antennas is known as a “distributed antenna system” or DAR. This post will take a closer look at how they work. Let’s face it, we live in a wireless world. And a wireless world poses some challenges that a wired one does not. For instance, you likely have a WiFi router in your home that you connect multiple devices to. Chances are that you can spend time in some rooms and get a stronger signal than you would in other rooms. Rooms located far away from the router may even be dead zones, or areas where you’re unable to pick up the signal. This is where DAS can help. DAS basically consists of a network of strategically placed antennas inside buildings, homes and venues like the Notre Dame Stadium example we mentioned in the opening. Essentially, these antennas help eliminate dead zones and areas that receive spotty coverage. DAS networks typically consist of a base station, or signal source, which integrates with remote antennas. These remote antennas are often connected to the base station via cable. When DAS is properly designed and installed, it enables a universal satisfactory user experience with no dead zones or spotty areas. So the next time you’re in a large venue and getting poor cell service, you’ll know that the place likely has a poor DAS, or no DAS at all. Let’s go back to the Notre Dame Stadium example for a moment. It wasn’t always the most pleasant experience for fans when it came to cell service. No, there was actually a problem with antennas located in the stadium bowl and suites in terms of who was picking up the signal. For instance, some fans in the bowl part of the stadium were picking up the signal from the one meant for the suites section, bogging down the system. Hence, it’s important when designing a DAS that you ensure that only the people you want to be using it – or a particular part of it – are doing so. What’s more is cyber criminals could potentially be attempting to hack into your system from outside of your facility. What can you do, both in the Notre Dame example and cyber theft situations? The answer: protective window film, sometimes referred to as a "DAS shield." Protective window film is easily applied to any window and will essentially work to ensure that the signal from your network – or a part of your network – isn’t leaving the building. At Notre Dame stadium, the film was applied to the windows of the luxury suites, so the signal from that DAS antenna wasn’t reaching people in the bowl part of the stadium. For a business, the film can ensure that potential wrongdoers aren’t accessing the system from beyond your walls.